One thing that irritates me is to see a cabinet handles or knobs are not aligned properly. If a hardware template is used for aligning, marking and drilling the three sixteenths inch wide holes, the pulls can be in perfect position. When people install their kitchen or bathroom vanity handles or knobs by making freehand marks on the doors and drawer fronts, there is a huge margin of error. Even if they measure twice and drill once, there can be enough of an offset to make the hardware look crooked. One way to help ensure that the drill bit stays on course is by using a hole punch on the pencil marks before drilling the holes. If you are just changing cabinet handles, you may need to adjust the original holes a little by reaming them out a bit. You do not need a template for this task. Professional cabinet makers and installers use templates for drilling the holes in the doors. You can make your own out of wood or buy one. There are many different styles available. The prices can range from ten dollars to well over a hundred. These jigs can be purchased from online sources and at Lowe’s or Home Depot. If you choose to make a jig out of wood to use as a guide, there’s something that you must be aware of. With every hole you drill into the cabinet doors, the hole size of the template gets bigger. As the hole enlarges on the jig, there is more room for the drill bit to be off target. This may not seem like something to be concerned about, but if two handles are next to each other on a pair of doors and the hardware is off by one sixteenth of an inch, this equates to being one eight of an inch off from center. That is a very noticeable difference. Trust me on this one. I’ve seen my share of crooked cupboard handles that were not installed off center. 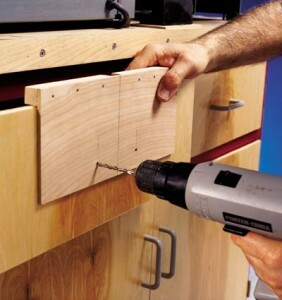 There is a correct way to drill for cabinet handles. The best door guide for drilling holes will have metal inserts for the drill bit to be guided through. The metal sleeves keep the pilot hole from getting bigger. Most store-bought models will have adjustable arms on them. The lessor expensive models of cabinet hardware jigs will be made out of plastic. These usually only allow for you to mark on the kitchen cupboard door or drawer face where the holes should be drilled. They cannot be used as a physical guide for the drill bit to go through. You will achieve very accurate marks by using one of these guides. You must use a nail punch to ensure that your drill bit stays on the mark and doesn’t walk on the material. My final thought, do not drill your cabinet doors without using a cabinet hardware template. I agree, it doesn’t matter how much you try. If you use a pencil to mark holes to install cabinet hardware on doors / drawers .. whatever, some WILL BE CROOKED. I used to install cabinets and nothing is better than a factory built jig.